Septa Therapeutics Inc. is a biotechnology company devoted exclusively to the development of an effective treatment for Alzheimer’s Disease (AD). The scientific community has looked long and hard for the "trigger" that initiates the events leading to AD and agrees that it lies somewhere in the amyloid beta protein that accumulates in the brains of AD patients. Septa Therapeutics Inc. has identified the likely trigger, using a new approach, based on the platform technology developed earlier by CEO Diane Van Alstyne, Ph.D.
Dr. Van Alstyne did her Ph.D. at UCSD, La Jolla, in Molecular Biology, was a post-doctoral fellow at McGill in virology and was Assistant Professor in Neurology (Multiple Sclerosis (MS) Research Unit) at the University of British Columbia. 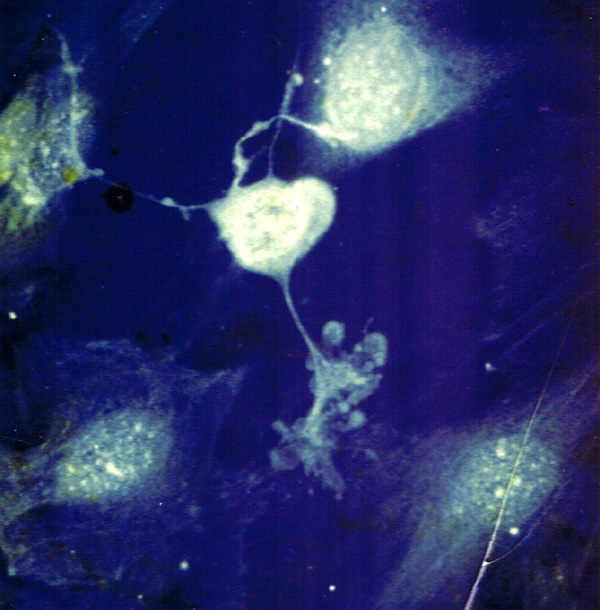 Her work in understanding persistent rubella virus infection in the Central Nervous System (CNS) contributed directly to the development of beta interferon as the first drug for MS.
She was then invited to Neuroimmunology at the NIH, Bethesda, where she made the first monoclonal antibodies to rubella virus. Upon her return to Vancouver, Dr. Van Alstyne founded Insight Biotek, and used the new antibodies to focus on diagnostics and vaccines for bacterial and viral meningitis. This work culminated in a new diagnostic device and a ground-breaking, universal, one-shot-does-all, vaccine for bacterial meningitis, summarized in 3 issued US patents (see Technology). With Dr. Van Alstyne’s exceptional track record in getting results in MS and Meningitis studies, this current work in AD holds great promise. 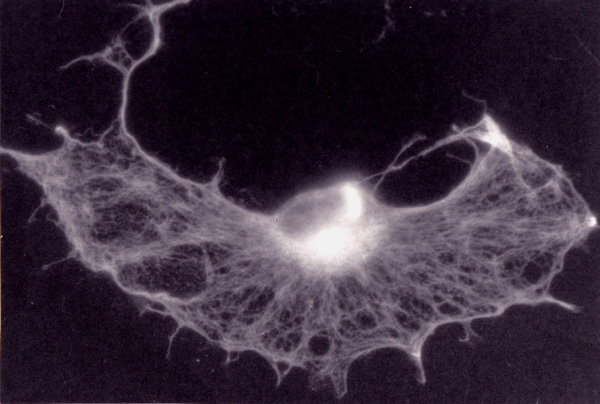 A rubella virus-infected stem cell from rat brain forming an astrocyte in culture. (Pope & Van Alstyne, Virology 113(2):776-780, 1981).